Call 828-468-8831 to schedule your first appointment. Rather than avoiding birthday parties and other social events, see how hearing aids in Boone, NC, can help you improve interactions with family and friends. Here at Miracle-Ear®, we know that hearing challenges can lead to isolation and feelings of frustration, but this doesn’t have to be the case. We have the solutions you’ve been looking for, and you’ll benefit from our caring service. Our hearing aid center is independently owned and operated, and we offer a range of services to help you hear better. While it all starts with an exam to assess the damage, it culminates in the fitting of a hearing aid that’s effective and comfortable. In the past, hearing aids were cumbersome, readily visible, and difficult to control. With our GENIUS™ Technology, you can hear the world around you with crystal clarity while having excellent control over the volume. Our hearing aids are designed for people with mild to severe hearing loss. Most of them fit discreetly in the ear, but we also have Behind-The-Ear models for those people with sensitive ear canals. Many are available in different flesh tones, so they’ll blend right in with your skin. There’s no shame in scheduling a free hearing test*, and you’ll appreciate being able to hear clearly with a new hearing aid. We offer an unmatched three-year warranty** on our products, and we provide regular cleanings and inspections to keep them in top working order. People throughout Boone and the surrounding areas have turned to Miracle-Ear for assistance, so call us today. Michelle Moretz joined the Miracle-Ear organization in 2016. She is grateful for the opportunity to help the people in her community, and surrounding areas as well. When asked what she enjoys most about working with patients, she responded, "I love seeing the smiles on people's faces when they are able to hear again." Michelle understands how life-changing the transition from hearing loss to sound can be, as she, herself, wears a Miracle-Ear hearing aid. A native of Watauga County, Michelle looks forward to meeting you at the Miracle-Ear Boone, NC office. 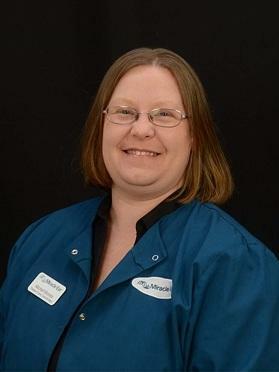 She is blessed to be a part of the Miracle-Ear family, and is excited to help you begin your journey to better hearing.